In order to decide the lifestyle I would take on for the week, I set up an Instagram poll. Disappointment hit me upon receiving the results. “Fashion Account- 74%” read my phone screen. This meant I would have to run a fashion account on Instagram. As my family’s certified least fashionable relative, this was horrible news. I do not enjoy shopping, I do not like to care about how I look and I have never opened an issue of Vogue or Harper’s Bazaar – until now. Instilled with this knowledge, I was ready to trek into uncharted territory: the mall. After years of avoiding the “skinny store,” Hollister, I made my first strides into the shop. I could not find a single pair of jeans that fit me the last time I went to Hollister, so this was a bold move. As a very modest person, the result of insecurity, I struggled with a lot of different styles. I wanted to be transparent in which styles were trending, but I also could not bring myself to wear cropped and tight shirts. 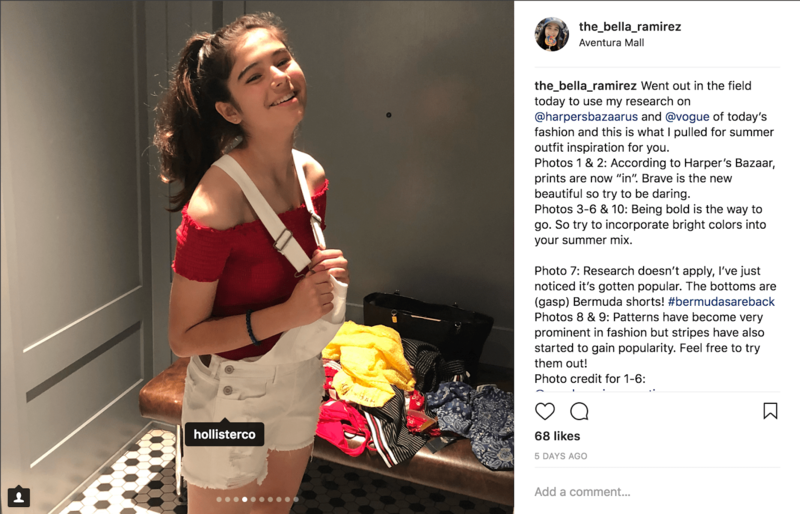 Somehow, the little voice in the back of my head would just shout, “This does not fit you there!” or “You do not look good!” Hollister proved to be particularly painful, with tight clothes lined on every rack. After an hour I found four outfits that fit well enough to seem both fashionable (according to Harper’s Bazaar) and to still be me. Social events on Day Three put my fashion confidence to the test. With everyone wearing dark blue clothing, I stuck out like a sore thumb in my red sundress. After seeing my demeanor change my mom had to sit down to give me a heart to heart on how fashion was about being yourself. I could wear something unfashionable and dirty, but if I strutted around like I owned the place then it would be a better outfit than slouching ashamedly in the world’s prettiest ball gown. Once again there was an internal fight between my inner critic and my hopeful exterior. This week was making me look at myself from a whole different lense. While I was fighting an internal war in the dressing room, my friends were sending supportive messages to help me overcome my teeming troops of self-criticism. This was just what I needed to get through the week. Although the experience was hard for me due to views of my body, my supportive friends were able to help me see the bright side in the mirror. Now I can leave the house looking nicer than I did before and feeling a lot more confident in myself. So, if you are having trouble with how you see yourself in certain styles, feel free to experiment but make sure you stay true to yourself. The only thing that always stays in fashion is self-confidence. Verdict: FLIP, my life is changed for the better.